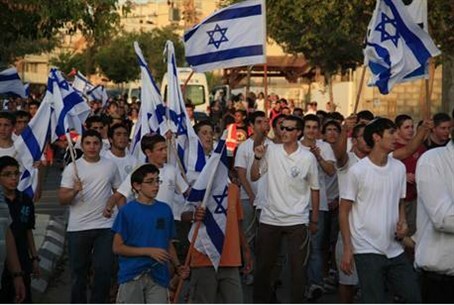 Young Zionist activists travel to southern Israel to show unity with dancing, celebration. Hundreds of young Zionist activists went south for the weekend to show their solidarity with residents of Ofakim. The group, organized by the Ichud Leumi (National Union) party’s Youth Leadership, held “flag dance” celebrations in honor of Jerusalem Day. Ichud Leumi was joined by activists from the Jewish Home party. Several hundred Ofakim residents joined in as well, bringing the total number of celebrants to over 1,000. Danoch expressed frustration over the situation in the city. “It’s outrageous that every few months Hamas fires rockets and shuts down the whole south,” he said. MK Michael Ben-Ari (Ichud Leumi) joined the event, as did Rabbi Avinoam Horvitz. “We are the party of Jerusalem, we are the movement of Jerusalem, and we must move the country forward. We will grow strong and be strengthened in the name of Jerusalem,” Ben-Ari said.